Walk For Life takes place this Sunday! 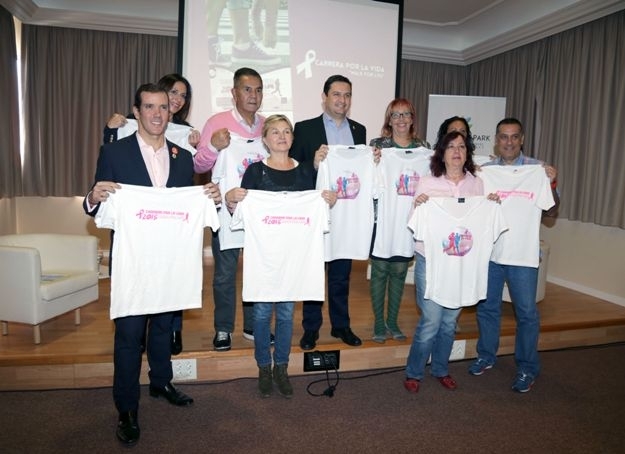 From 10.30am onwards on the morning of December 13, 2015, a wave of people in pink will line the streets between Costa Adeje and Arona – and all in aid of breast cancer charities. 09.12.2015 - The 2014 Walk For Life brought together 2,800 people and raised nearly €30,000 for the Spanish Association Against Cancer and the Ámate Association. Now in its eleventh year, this year’s walk will cover a 4.8 kilometre route: from the Magma Arte & Congresos Centre, Costa Adeje, to the Plaza del Pescador, Los Cristianos. The official presentation of the event took place on December 9 at the Paradise Park Hotel in Los Cristianos, and was attended, amongst others, by the mayors of Arona and Adeje, José Julián Mena and José Miguel Rodríguez Fraga; as well as the organizer of the race, Brigitte Gypen, and the recently welcomed ‘face’ of the campaign, basketball legend Alejandro Martínez. Martínez has been active in promoting the fight against breast cancer within the sport for a while, and with some nice touches - in October of this year he persuaded the ACB league referees to use pink whistles during matches throughout Spain: The ex-coach of Tenerife Iberostar ACB was the perfect person to be selected to be the very first ‘star’ representing Walk For Life. WFL seeks to raise awareness in the fight against breast cancer, as well as funds for the charities that work hands-on with those affected. The presentation ceremony was also attended by the president of Ámate, Maria del Carmen Bonafonte, and AECC manager in Santa Cruz de Tenerife, Carlota Cobo, as well as several members of the Adeje and Arona councils. Walk For Life is not a sporting event – it’s a terrific way to raise awareness and visibility - so the organisation has arranged various collection points throughout the route so those who wish so can be transported straight to the finish line! So why not give it a go? It starts at 10.30am on Sunday December 13th, leaving from the Magma Arte & Congresos centre, Costa Adeje. Organisers invite participants to arrive early to register – by 10am if possible - and enjoy the pre-walk atmosphere. You can also register in advance online at carreraporlavida.com. Gallery: Walk For Life takes place this Sunday!